It seems rather sad that on the very day our parliament would approve fracking in our national parks, we would be sitting in the magnificent Old Vic watching the Lorax presents his passionate case for the environment. And boy would you get fired up, especially when you read the next day the government is also cutting subsidies to renewable solar energy. Adapted for the stage by David Greig and directed by Max Webster, The Lorax is based on Dr. Seuss's classic tale of the eponymous cranky mustachioed grouchy critter out to protect his woodlands from the businessman and Thneed-knitting industrial businessman, Once-ler, whose greed ultimately caused the destruction and deforestation of the Lorax's forest. A fable if you will, about the dangers of corporate greed versus the need to preserve nature. Made for both adults and children, the production is filled with catchy songs performed by a hugely talented cast, theatrical set and excellent puppetry. The Lorax itself comes alive through no less than three puppeteers, who controls its legs, hands, head and voice. And despite being visible the entire time, the casts also blend into the background quite effectively, no doubt because of how alive the Lorax himself appears. 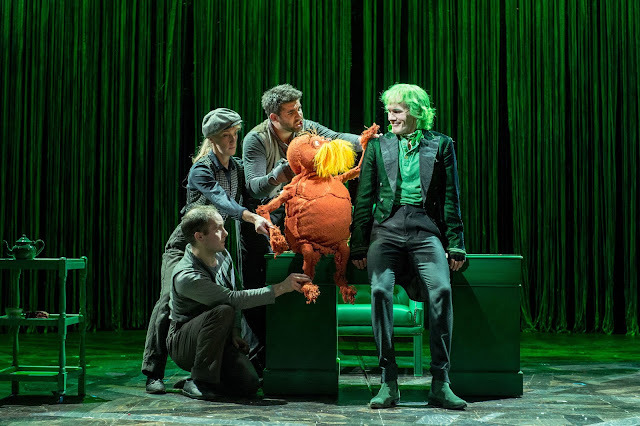 A delightful play, the Old Vic's production of The Lorax makes an excellent Christmas alternative to the usual Nutcracker. While some of the political and environmental messages may go above any children's in attendance, they will be entertained by the music and puppets. By the end of the play, they will get the message. One plant at a time. Dr. Seuss’s The Lorax runs until 16 January 2016.